(TEB) Teterboro Airport is the most important and widely used private aviation airport in the United States for private aviation, and the #1 business jet airport in NYC. Although KTEB Airport is located across the Hackensack River in the New Jersey Meadowlands in the boroughs of Teterboro, Moonachie, and Hasbrouck Heights, it’s a mere 12 miles west of Midtown Manhattan, making it the preferred choice for private planes and corporate jets heading to New York, NY. Teterboro (TEB) has a 7,000 foot asphalt runway, which can accommodate helicopters, pistons, turbo props, and private jets. Teterboro’s Airport is easily accessible and the most convenient airport for travelers visiting New York City for business or pleasure. 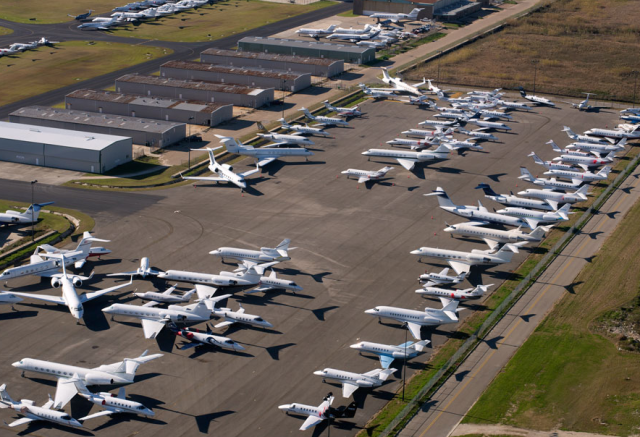 Teterboro doesn’t receive any commercial air traffic, dedicating all of its resources to private & business aviation; KTEB airport operates with a 100,000 lbs. weight limit, making commercial airline operations nonviable. Teterboro is the oldest operating airport in the NYC area, with the property originally acquired by Walter C. Teter in 1917. It served as an aircraft manufacturing center during World War I, and the first private company delivered mail by air from the airport in 1926. A total of 19 hangars are located on-site, offering a total area of just over 400,000 square feet. The Department of Homeland Security is housed within two large office buildings, and additional offices and shops covers around 165,000 square feet of space. There is also an operations building, maintenance facility, and two fuel farms. Aviation enthusiasts can check out the Aviation Hall of Fame of New Jersey. Private jets operate using Teterboro’s dual asphalt runways: Runway 1-19 measures 7,000 feet long and is equipped with High Intensity Runway Lights (HIRL) and Runway End Identification Lights (REIL) systems. In the summer of 2000, Runway 1-19 was overlaid and grooved and a centerline and touchdown zone lighting was installed. Runway 19 is the main runway for private planes due to noise abatement procedures. It’s approach has an Instrument Landing System (ILS) and a Precision Approach Path Indicator (PAPI). Runway 1’s approach features a Visual Approach Slope Indicator (VASI). Runway 6/24 measures 6,013 feet long, and features HIRL as well. The approach to Runway 6 offers an ILS and a Medium Approach Lighting System-R (MALS-R); Runway 24 offers both PAPI and REIL systems. For international travel, Teterboro Airport offer customs in two locations: Hangar #1 and the Jet Aviation FBO. Although the airport is open 24/7, customs hours at KTEB are between 7:30 AM – 11:30 PM local time, however, special accommodations may be possible upon request. After clearing customs, we can arrange for private helicopter rentals for quick transfers to the East 34th Street Heliport, the West 30th Street Heliport, or the Downtown Manhattan Wall Street Heliport. Luxury ground transportation is also available.